It has been a while since our last blog post but something pretty exciting was released! The Gopro Hero5 Black and GoPro Hero5 Session was just released today! The past 3 or maybe even past 5 years every Gopro release has just been "alright" in our eyes and something was always missing on the camera that we wanted but this release had us excited enough to upgrade from our gopro hero3 and we went out and bought these cameras. First, I really liked the release of the Hero4 Session last year because of the size and the built in housing but the quality was a lot less than the Hero4 Black so it was not a buy for us. I continued to use my Xiaomi Yi since it is less than $100 and produces similar quality to that of the Hero4 Session. But the big thing for me is not the 4k but the gopro image stabilization that is now in the GoPro Hero5 Black and Hero5 Session. The GoPro Hero5 Session now has a high quality video output, not as high as the highest setting on the Hero5 Black but high enough to have awesome quality! The GoPro Hero5 Black now has super high quality. The other great feature is it too is waterproof without a housing now just like the Hero5 Session camera. Also it has built in GPS so can have speed and location overlay on your videos. 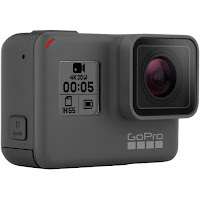 So, if you are going to use either of these cameras in the surf, we would recommend the GoPro Hero5 Black because it has a built in lcd screen so you can always know where you are pointing it. 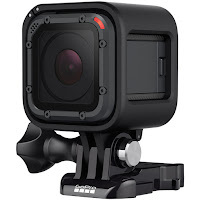 If you are using the gopro out of the surf and on a bike or car or whatever, I would get the GoPro Hero5 Session and just use the GoPro app on your phone to see where you have the camera pointed and away you go! Finally after many years, GoPro finally released an all round high quality camera that has everything we wanted. What do you think? Let us know in the comments below. We have received our full range of Scarfini Fins minus a few of the quad sets that aren't yet available. 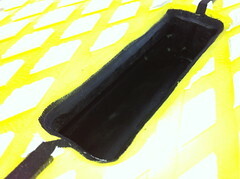 Check them out in our surfboard fins sections. Also we started to carry some Captain Fins and some hand made wooden longboard fins from Jett Fin Co out in Santa Cruz, California. A couple of months ago I bought a GoPro. This GoPro I bought was the HD Hero model. Well its been sitting on my desk with many my many ideas to use it with but never actually do anything about. I decided to put the surf mount on my friends 12' Starboard Big Easy. My friend took his stand up paddle board out in .5-1ft small surf at Birubi which is in Anna Bay, NSW. The next day I put the footage together and made a video and put it on youtube. I have to warn you the soundtrack was not my choice, it was my friends request. I bet he couldn't do this on a Inflatable Stand Up Paddle Board. As you can see, some water was on the lens a few times. I've read rainx does the trick. Any recommendations? The next day my friend went for a surf without the Gopro on his board and the surf mount with 3M tape came off. I thought 3M was the stickiest?